Something happened during March. Well, a few things. 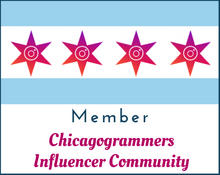 I managed not to post a single blog, I totally fell off the Weight Watchers bandwagon and I tripped, fell and tumbled quite un-gracefully to my knees while running on one of the busiest streets in Chicago. Fabulous. I quickly mumbled an incoherent f-bomb, then recovered enough to speed-limp away from the stares of the gaping hipsters. Only, my leg hurt. 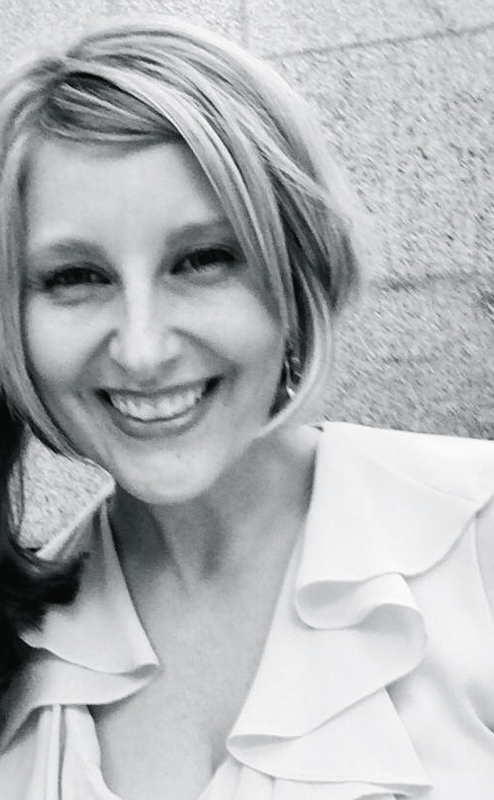 My knees were bloody and my hands were missing some skin, but the real problem was my left leg – some sort of muscle behind my knee felt pretty terrible. That thing hurt (badly), but I stupidly pressed on, determined to hightail it to Kmart to redeem some coupons. This was probably a mistake, as that thing still kind of hurts, but hey, I’m set on Ziploc bags for the next year. A torn muscle is a small price to pay for such a luxury. So I took two weeks off running, and 3ish weeks off my diet, because that makes good sense. 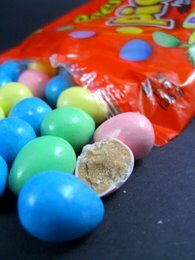 I sunk so low that I managed to have McDonalds twice before 8 a.m. the other day, and I probably single-handedly kept the Reese’s Pieces Easter egg factory in business this year. Damn, those little eggs are good. But, like always, I’ve got to reign things in and make an effort to throw away that gigantic bag of fried cheese balls I accidentally bought yesterday. 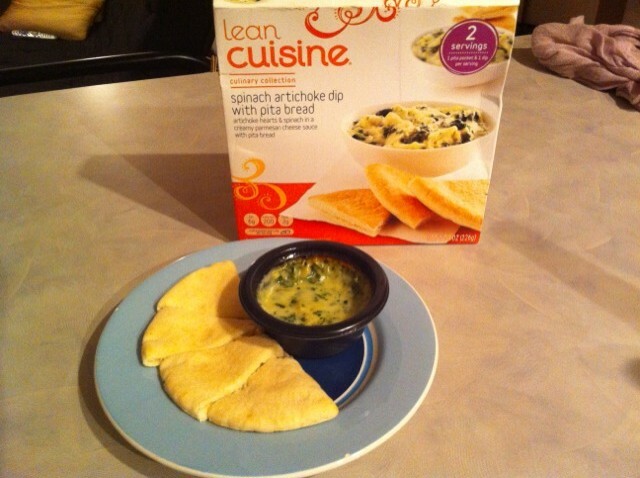 Luckily, things over at Lean Cuisine seem to be on the right track, too. Instead of making things that people sort of dread to eat, they’re making things that are fun to eat, like cheesy dips and spring rolls. I live for dips and foods in the shape of taquitos, so it’s no wonder that both the Spinach Artichoke Dip and Thai-Style Chicken Spring Rolls get my big stamp of approval. Mmmm, dip. I ate this the other night after I had an early dinner of the new Dorito Taco Loco from Taco Bell (more on that later). I was hungry, but not starving, so thought this would be a sensible option. Notice how I cut that pita bread into 4 chunks, not the mere 3 pictured on the box (genius). You might not be able to tell, but that’s actually a pretty large amount of dip. In fact, there was even dip left over when I was done, and I am NOT just putting a smattering of dip on my bite of pita. I’m double dipping all day long, and basically just using the pita in lieu of a spoon. This dip is delicious, tastes like something you’d get at a restaurant, and will cost you just 5 Points Pluses for one pita and one dip (2 come in a box). It makes an awesome snack, and would be perfect with a small salad or veggies for lunch. Disclaimer, they do not come with those multi-colored pepper strips; I merely added those for garnish and nutritional benefit in the days when I actually cared about eating a vegetable. 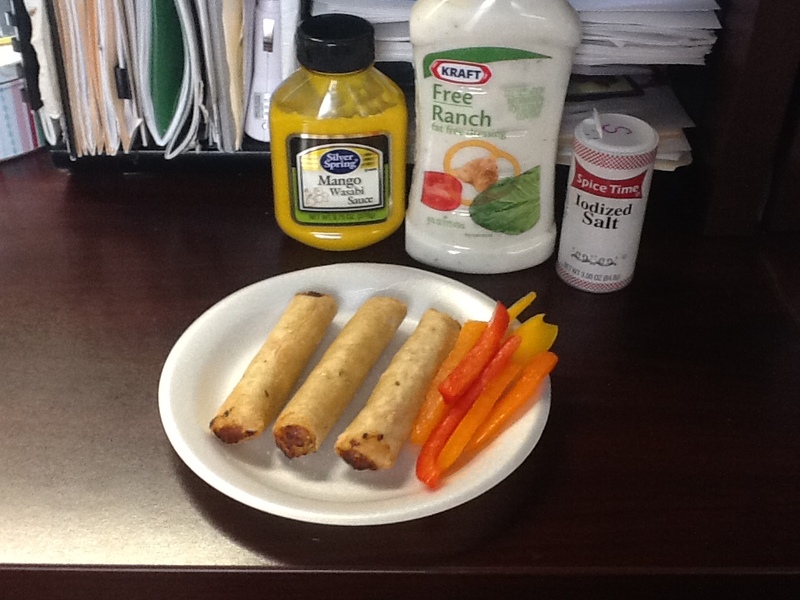 Alright, listen, I’m not getting paid in free Lean Cuisines or anything, but these spring rolls are insanely good. They have a bit of a coconut zing to them, which I love. They, too, are only 5 Points Pluses for 3, and are another excellent snack/late night after bar option, or nice for lunch with a side of veg. I even served them to my intern a few weeks ago, and he agreed that they’re great. I highly recommend you pick them up next time you’re in the “Single Dinners” section of the frozen foods aisle. I really like Lean Cuisine’s line of Panini sandwiches. If I must eat a frozen meal for dinner (and I seriously try not to – it depresses me), I’ll pull out a Lean Cuisine pizza or panini and pair it with a small salad or a mug of soup. I typically shy away from the pizzas and paninis for lunch since they all are at least 6 points, and I try to keep my main lunch entrée at 5 points or less. But then there are times when you’re so far off your diet that adding 1 point to your typical lunch is not going to make any difference and you might as well chow down. 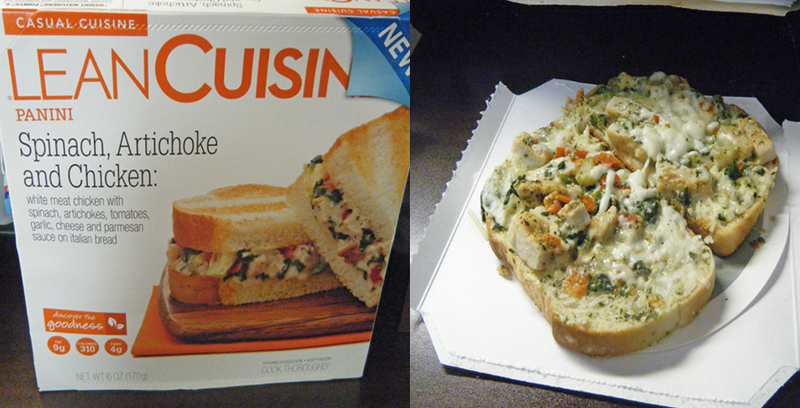 I tried the new Lean Cuisine Spinach, Artichoke & Chicken Panini for lunch yesterday. LC describes it as “seasoned white meat chicken with spinach, artichokes, tomatoes, garlic, cheese & Parmesan sauce on Italian bread.” It contains 6 Weight Watchers points. Simply put, it was awesome. It had a ton of flavor, the artichokes were a highlight and the sauce brought everything together. It looked good, tasted great, and I will definitely be adding this to my frozen dining repertoire in the near future. I didn’t add anything to it, and (like I always do) I ate it open-faced. If Lean Cuisine thinks I’m going to stack these 2 sandwiches on top of one another, they’re dead wrong. I like having the look of a lot of food on my plate, and I’m not about to visually halve my lunch.